DESIGNED FOR LARGE COMMERCIAL POOLS, THIS REEL IS SUPER STRONG, LIGHTWEIGHT, AND EFFORTLESS TO USE! Our deluxe commercial reel is the finest solar reel we sell. Designed for rugged use by large commercial pools like YMCAs and universities, we have made this exceptional reel available for private pool owners who want the best. Featuring an extra heavy gauge powder-coated aluminum frame, this reel can easily support up to a 60-ft. long solar blanket. This frame is lightweight, yet strong, and will never rust or corrode. The big 3-1/2”-diameter anodized aluminum tubing is reinforced and will not sag or bind like reels of lesser quality. Stainless steel bearings and hand crank at one end ensures effortless removal of your solar blanket. 2" locking casters provide complete portability. The reel stands 26” high and allows you to operate it comfortably without kneeling. 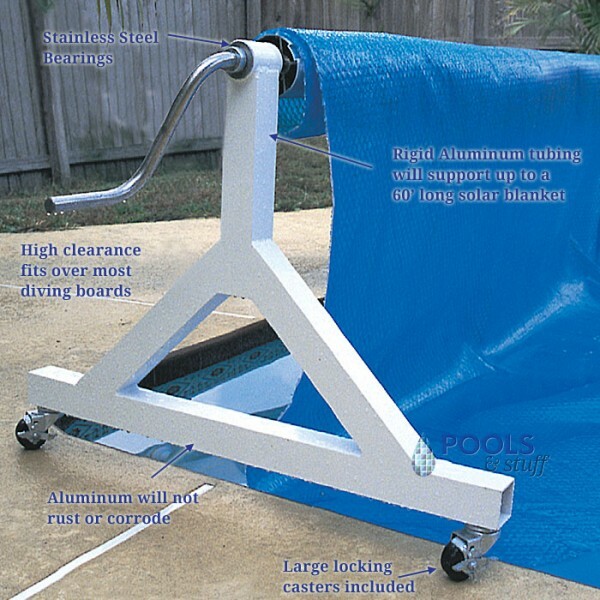 Because of its height, it clears most diving boards and easily rolls out of the way on its large locking casters. Our commercial reel comes complete with casters, blanket attachment kit, and is easy to assemble. Can easily support up to a 60-ft. long solar blanket.